A Word From Bert Kinister. Take Bert’s Challenge. Sign up (external web-link) for Bert's videos now and take this challenge: Look through the video lessons and find one that you think is the worst. Do what is on this video one hour a day,at least five days a week for six weeks. Be sure to look at all or part of a different video everyday while you are taking this challenge. You will be amazed with the progress you have made. Once you see what you believed was the worst video has done for your "8-Ball", "9-Ball", "Bank Pool", "One Pocket" and "Straight Pool" games for your pool and billiard skills, think about all the potential you can unleash by viewing and learning from the rest of Bert’s videos. 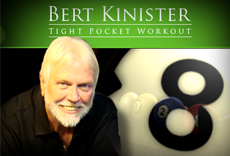 You will understand why people say, "More than anyone, Bert Kinister has changed the way the entire world plays pool. No one else in history has done more to elevate the level of pocket billiard play." "The 60 Minute Workout For 8-Ball and 9-Ball" Video was named "BEST VIDEO" for "9-Ball & 8-Ball"by "Pool & Billiard Magazine." Take advantage of this opportunity now! This is an introductory offer, prices are subject to change without notice. As a subscriber, you can access all 97 "One-Hour" DVDs 24/7 on your computer, iPhone and iPod-Touch for less than 22 dollars a month with your premier subscription. If purchased separately at their retail price of $31.95 each, they would total more than $3000. This is an absolute groundbreaking service for present and future pool players. 97 Videos all about Pool and Billiards. These 97 separate "One-Hour" pool lessons featuring 100% of Bert’s original material have been used by thousands of players over the last 22 years. During these years Bert has created five new videos every year without repeating any information. This has made him the world's best and most influential instructor. He has helped tens of thousands of pool and billiard enthusiasts to become better players than they ever dreamed possible. Bert's instructions and drills are often imitated but never duplicated. None of his material is a product of "researching" someone else's work and then "rewriting" it as his own.